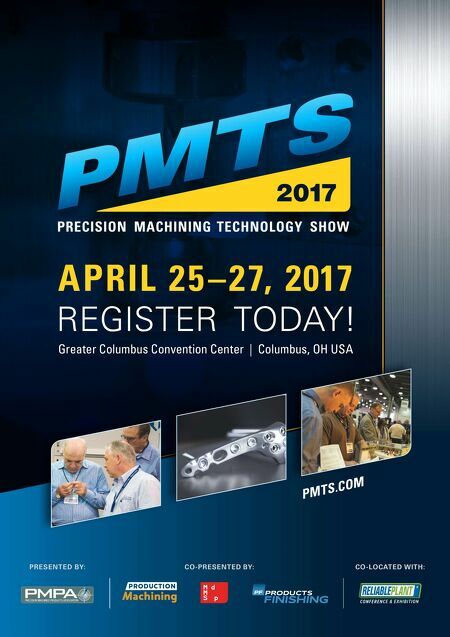 66 MMS January 2017 mmsonline.com CNC TECH TALK Columnist As CNC application has evolved over the years, CNC providers have developed a variety of ways that certain CNC features can be utilized. Indeed, almost every critical CNC feature can be put to use in multiple ways, and misapplications can lead to under-utilization of CNC machine tools. In some cases, usage methods even conflict with one another, meaning a usage method that works nicely for one company will not be appropriate for another. In order to make the best use of your specific CNCs, you must know your options. Then, you must choose the usage options that are appropriate to your particular company. Here are some common examples of such CNC options, along with a few suggestions for use. Conventional (of fline-programmed) vs. conversational (shop-floor-programmed). This programming decision should be based on three factors: lot size, repeat business and program cycle time. 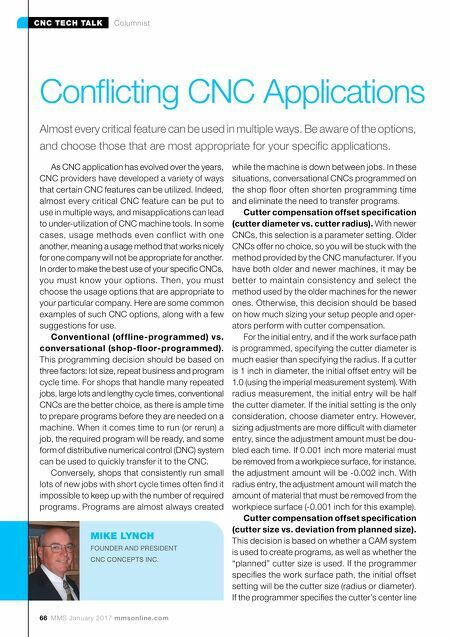 For shops that handle many repeated jobs, large lots and lengthy cycle times, conventional CNCs are the better choice, as there is ample time to prepare programs before they are needed on a machine. When it comes time to run (or rerun) a job, the required program will be ready, and some form of distributive numerical control (DNC) system can be used to quickly transfer it to the CNC. Conversely, shops that consistently run small lots of new jobs with short cycle times often find it impossible to keep up with the number of required programs. Programs are almost always created while the machine is down between jobs. In these situations, conversational CNCs programmed on the shop floor often shorten programming time and eliminate the need to transfer programs. Cutter compensation offset specification (cutter diameter vs. cutter radius). With newer CNCs, this selection is a parameter setting. Older CNCs offer no choice, so you will be stuck with the method provided by the CNC manufacturer. If you have both older and newer machines, it may be better to maintain consistency and select the method used by the older machines for the newer ones. Otherwise, this decision should be based on how much sizing your setup people and oper- ators perform with cutter compensation. For the initial entry, and if the work surface path is programmed, specifying the cutter diameter is much easier than specifying the radius. If a cutter is 1 inch in diameter, the initial offset entry will be 1.0 (using the imperial measurement system). With radius measurement, the initial entry will be half the cutter diameter. If the initial setting is the only consideration, choose diameter entry. However, sizing adjustments are more difficult with diameter entry, since the adjustment amount must be dou- bled each time. If 0.001 inch more material must be removed from a workpiece surface, for instance, the adjustment amount will be -0.002 inch. With radius entry, the adjustment amount will match the amount of material that must be removed from the workpiece surface (-0.001 inch for this example). Cutter compensation offset specification (cutter size vs. deviation from planned size). This decision is based on whether a CAM system is used to create programs, as well as whether the "planned" cutter size is used. If the programmer specifies the work surface path, the initial offset setting will be the cutter size (radius or diameter). If the programmer specifies the cutter's center line Conflicting CNC Applications Almost every critical feature can be used in multiple ways. Be aware of the options, and choose those that are most appropriate for your specific applications. MIKE LYNCH FOUNDER AND PRESIDENT CNC CONCEPTS INC.